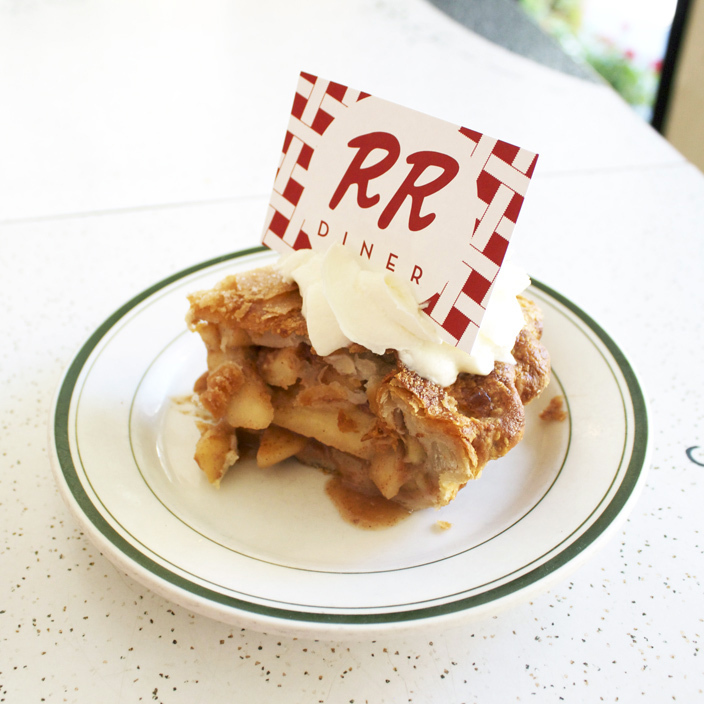 The Double R Diner is a community-hub of Twin Peaks, and one without much scandal. I wanted the brand to reflect an open, welcoming atmospehere and still maintain a classic ‘50s diner aesthetic, while ushering it into the 21st century. Clean, professional, but still friendly and unpretentious. Being such a Twin Peaks fan, I sprinkled a few quotes from Agent Dale Cooper throughout as customer testimonials. I designed a menu, postcard, business card, and dessert menu. Don’t miss the Cooper Special: a cup of coffee and a slice of cherry pie! I knew I was going to need a great “R” when I sat down to start brainstorming. I consulted my wonderful “Custom Lettering of the 40s and 50s” by Rian Hughes to get some inspiration. I wanted a very specific and slightly imperfect look, so I chose to hand-draw the RRs. As you can see, I went through quite a few. To the left at the bottom, you can see the other two final contenders. I felt the first one was a little to mysterious with the big looping Rs facing each other. It felt a bit Lynchian, which was great, but the diner itself is very accessible to everyone. It also reminded me a little bit of an elephant skull? That may just be me. The second one felt a little too masculine and tight for a business run by someone as kind as Norma Jennings. Maybe that style would work best with Ed Hurley's gas station? Ultimately, I chose the logo you see on all the finished pieces. Since everyone is always expounding on the brilliance of that cherry pie, I wanted to feature that in the branding. People love it and the branding should remind them of that! I hand drew a pie lattice for a background pattern. I cleaned it up in illustrator and used it as a graphic element. I actually used the menu of Twede’s Cafe, which is where the Double R Diner was filmed. I made a few edits (Twede’s has a burger menu of over 50 offerings!) because I wanted to keep everything on one page. That presented a bit of a design challenge, but one I really enjoyed. I focused on getting all the information in, with careful attention to not overwhelm. In Twede’s menu I found a lot of redundant information that could be simplified with a little design. I did a bit of research on menu design and profitability. 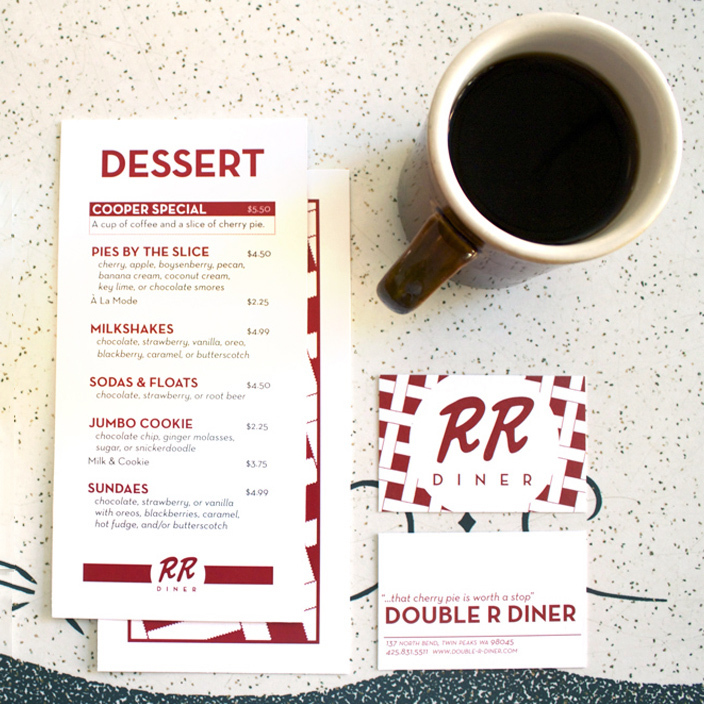 The menu was definitely the most time-consuming aspect of The Double R Diner branding, but I was happy to work out all those tiny typographic details.